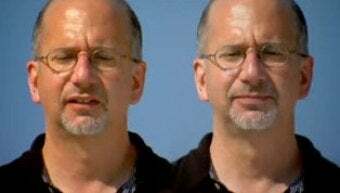 The McGurk effect is a powerful illusion where our brains hear the wrong noise if they're presented with visual evidence that something else is being said. Now we've discovered what part of the brain is behind this strange effect. We've already talked about optical illusions, but this auditory illusion might be even freakier. Let's say you record a person pronouncing a couple sounds over and over again - say, "bah" and "vah", which are very similar sounds made with clearly different lip movements. Now you keep the audio of the person saying "bah" but overlay it with the video of the person saying "vah." Which sound will you hear? Any sane person would think you'd still hear "bah", but that isn't the case at all. The mind prioritizes the visual information over the auditory information, deciding what it sees as the correct noise - the person mouthing "vah" - trumps the ears clearly hearing the person say "bah." You can literally watch the mixed video, clearly hear the person say "vah", then close your eyes and it immediately switches back to "bah", and the only change in sounds occurred entirely in your mind. That's the McGurk effect. Scientists have known about the McGurk effect since 1976, but could only speak in general terms about what actually caused it. Now, researchers have been able to trace exactly where the McGurk effect originates. By conducting MRI scans on subjects experiencing the effect, researchers at the University of Texas discovered which part of the brain was active. The culprit is the superior temporal sulcus, which has previously been identified as important in both language and eye gaze processing. Once the researchers discovered this was the nexus of the overlap, they used magnetic stimulation to disrupt the functioning of the superior temporal sulcus. With it temporarily out of commission, the McGurk effect completely disappeared, and the subjects were able to hear what was actually being said, not what was being mouthed. So, it appears that if you want to stop the McGurk effect in its track, just aim a powerful magnet at your head whenever it starts kicking in. Actually, on second thought...maybe you should just enjoy the illusion while it lasts.